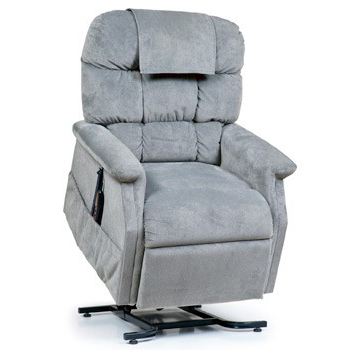 The Golden Tech Cambridge Lift Chair features a plush, overstuffed "biscuit back" design for long, restful hours of relaxation and sleep. The Cambridge comes in Golden's exclusive SofTouch(TM) fabrics in Calypso, Copper, Hazelnut, and Sterling. The Golden Tech Cambridge Lift Chair features a plush, overstuffed "biscuit back" design for long, restful hours of relaxation and sleep. The Cambridge comes in Golden's exclusive SofTouch(TM) fabrics in Calypso, Copper, Hazlenut, and Sterling. Expert craftsmen blend the finest components with superior designs to provide you with the utmost quality, comfort and style. Suggested User Height: 5'4" - 5'10"